The Yamaha YFL-577H Professional Flute makes for a great first pro flute for advancing flute players. 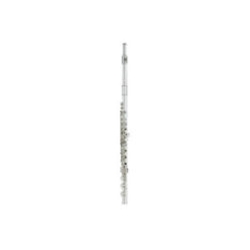 It incorporates primo features including European style pointed key arms and a hand-finished Type A headjoint, designed just like Yamaha's handmade 800 & 900 series flutes. This unique 577H model (577HCT) also features an offset G, C# trill key, B Foot with Gizmo, and Split E key mechanism.